31 pp booklet with examples of pages and teaching instructions from The Child Development Readers. Content includes In the Store, An Orientation Picture Story, Hurry! Hurry!, Taking Pony Boy Home, Good Times in Paul's Room, The Camp, A Dictionary Page, Milk to Drink in Lapland, Our Weekly News, Shopping for Toys and a page from the unit on Cotton. All examples from the Primer, First, Second and Third Readers. Captions at the base of each page indicate it's book and location. Color illustrations throughout. The back cover lists all of the Child Development Readers. Measures 8" x 5 1/4". .
36pp. Orange wraps. Includes students and officers, synopsis of courses of study, courses of study, departments of instruction and general information. A coeducational institution founded for the growing demand for higher and braoder education in Western North Carolina, and especially in the Reformed (German) Church. It includes a Ladies Boarding Hall. One of the departments of note is the Book-keeping Penmanship and typewriting established due to the demands of practical life for success in the business world. Concludes with expenses. Measures 8 3/4" x 5 3/4". .
16 pages, paper wrappings. Mayo's main topic in this booklet is about providing the structural needs and means for establishing quality education for all. He believes that taxation should be used in order to truly support public schools, and that it is a priority. Teachers also should be of good quality and educated in the profession in order to make schooling effective. In this address he makes it very clear that he truly believes that a good, solid education for everyone could improve not only the children's future, but the future of the country as a whole. As soon as the south started to implement his teachings that they would find their region becomes better for it. It is broken up into several subjects, such as "The Awakening of the People", "Local Taxation for Education" "National Aid for Education" and "The Free Library". Addressing aspects of his vision of a better American education system, Mayo believes he found the solution for the south. Although in segregated schools the need for higher education for African American children was emphasized as well. Measures 9" x 5 3/4". 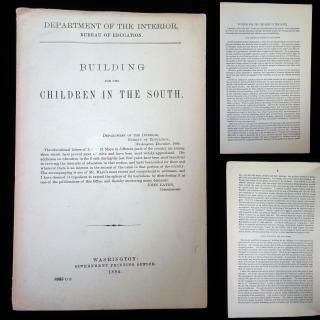 The Department of the Interior for the Bureau of Education felt that the information that Rev A.D. Mayo was both gathering and discussing, especially with his concentration of education in south, this publication would be a beneficial read and a useful resource. .
Esther Institute was the Columbus, Ohio's first girls' boarding school. It was founder by Lewis Hely in September 1853. The faculty at the school included Agnes Beecher Allen (1831-1919), niece of Harriet Beecher Stowe. 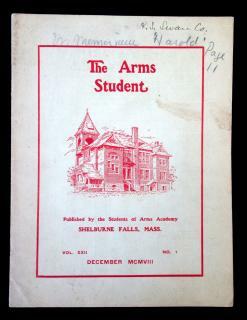 The item is a program for the June 1857 Commencement Exercises. It is printed on a single sheet of hounds tooth watermark paper with an engraving of a garden with a globe in it. It was closed in 1862, due to the American Civil War, at which point the building itself was used as a military hospital. After the conclusion of the war in 1865 it was reopened as Irving House and then eventually became a parish house for Trinity Episcopal. The building itself was demolished in 1916. Measures 10" x 8". Minor crease marks. 32pp.Yellow wrap.This book provides an overview of the school, staff, and students going in to the 1867-1868 academic year. The course of studies is substantially the form of theaching "Ratio studiorum, followed for more than three hundred years in the Jesuit Colleges in Europe and since 1790 in our own cuontry. Includes a basic outline of courses in the Humanities department, a list of the students and their year, shows a list of the members of several college clubs and societies, and ends with awards that were given to students at the end of the prior semester. 5 1/2" x 8 1/2". Previously known as Washington Seminary, re-opened for the youth of Washington city and its youth of Washington city and its vicinity, on the 2d day of October, 1848. It is conducted by the Fathers of the Society of Jesus. 191 pp. Decorated red cloth binding. Miniature book. A charming book that details the costumes and manors of different culture and time periods. While the book is not a scientific text book by any means, it attempts to be as thoroughly detailed as possible in its descriptions. The book is divided up into forty-five (45) categories, such as Russians and Spaniards. In some places it is divided up further into sub categories such as Persian Gentleman, and Persian Lady, or English Labourer (sp) of the Fifteenth Century and English Lady of the Fifteenth Century. Each section also comes with a picture of the people it's describing. With the frontispiece, there are a total of forty-six (46) wood cut engravings, black and white illustrations. There is one printer's mistake between the table of contents and the chapter titles. In the Contents, "English Gentleman of the Eighteenth Century", on pages 164 and 168 is repeated, while the actual chapter on page 168 is "English Lady of the Eighteenth Century." Measures 3 1/4" x 2 3/4". Covers show minor wear, particularly edge wear, due to rubbing. There is stain on the back cover. An inscription by a previous owner is on the front interior cover. Interior pages show minor foxing and soiling due to age. A handwritten teaching certificate awarded to Blanche Leavitt by E S Moulton, a member of the School Board of Belmont. Written by Clarence M Johnson, this letter describes a rather awful date he took Blanche on, when he took her for a drive. If appears as though nothing was on his side as the weather was terrible and Johnson spends most of the letter apologizing and asking to see her again. While the letter itself gossips about the family and friends they know, included with the letter is a 1901 Canadian penny. It was given to her to "fill up her bank"